It’s been hot, and our summer schedule is packed with play dates, visits to the sprinkler park, and trips to cooler indoor spots like the library when we need a break from the sun. That doesn’t leave a lot of time for sewing, but we can always sneak in a Lazy Days Skirt now and then when the sewing bug hits. 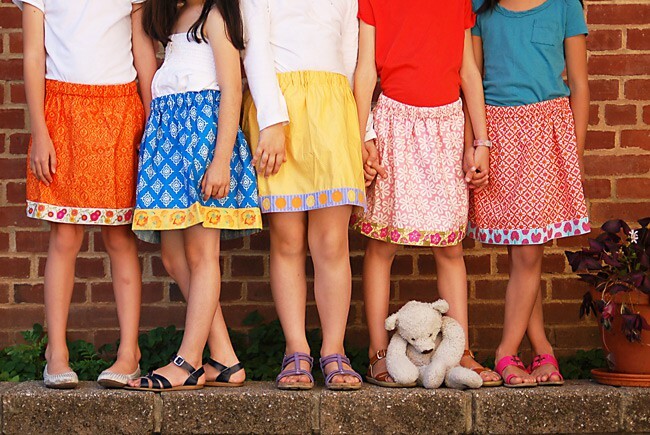 On the last day of school (just two weeks ago) we gathered S and a few of her classmates for a photo of some Lazy Day Skirts made using gorgeous Renaissance Ribbons and Moda fabrics (like Kate’s Spain’s upcoming collection, Cuzco). The skirts come together very quickly, which makes them a perfect summer sewing project. There are no pattern pieces, no seam allowances to finish, and the ribbon makes a neat and easy hem. But the girls don’t care about any of those details. They just love the bright colors, the soft ribbons, and the pretty patterns. Are you finding time to sew this summer? This is such a great project for a fascinating piece of fabric, or to highlight a gorgeous ribbon. I’ve made five so far this summer and I’m planning more. Quilting fabric works great, but using a wider shirting gives it a little extra fullness and comes out super-cute. yay for lazy days skirts! i recently made one in about 20 minutes, which is a long way from the 2 hours my first one (and first sewing project) took! great way to showcase beautiful ribbon, or beautiful fabric, or both!! really the perfect quick summer project. Simple designs are great for showing off lovely fabric, aren’t they? Darn you, Liesl! This post triggered a massive bout of procrastination–regarding my current sewing projects and life in general–and I was up WAY too late browsing adorable ribbons on Renaissance last night. I’m going to try to limit myself to three skirts, but since they only sell ribbon by full yards I ordered enough for two skirts for each of three patterns. Sigh. Oh wow, I have never seen that Ribbon webshop before. All those ribbons are gorgeous. Thank you for the tip! !